How do you watch the playoffs as a non-playoff team? A front office perspective. Plus some thoughts on playoff choking: I don’t know if some players choke in the playoffs, but I don’t think you do either. This is going to sound controversial, but hear me out: I’m not sure how much meeting draft prospects helps. There’s no doubt in my mind that who a player is as a person impacts their future success, but personalities of all types have succeeded and failed in the NBA, and I’m skeptical of anyone’s ability to suss out the essential elements of a person’s character in a short meeting. Job interviews in other industries have been shown over and over again to have little predictive power — why would the NBA be any different? Yet, even if it is unhelpful, meeting the prospects is enjoyable. It adds a dimension to them you can’t easily get otherwise. A player you’ve studied for months, maybe even years, seems distant, like a character in a movie or a novel — seen on a screen or in the pages of scouting reports but still not real. When you meet them, though, they pop into focus, a person. How they talk, how they think, whether they are nervous or confident or aloof — it may not help you predict whether they’ll succeed or fail, but it sure is interesting. On one particular night in the 2013 offseason, though, I wasn’t as enthusiastic as normal about one of our group dinners with a draft prospect. That night there was also a pivotal game in the epic Spurs-Heat Finals, and the fan in me desperately wanted to watch it. “It’s frustrating that we’re going to miss the game tonight,” I said to a co-worker. It’s not that you don’t watch the games. Just that, ultimately, watching takes a back seat to offseason preparation. There are big decisions looming, and never enough time to study them to the level of detail that you’d like. Scouting events like the mid-May Draft Combine, prospect interviews, film review, meetings — all of it matters more than making sure you catch all of the games on any particular evening. When you are able to watch, you’re watching differently than most everyone else. You’re watching to scout players, particularly those that are free agents or might be available via trade. And you’re watching to size up your own team and players. How does your team compare to those still playing in each successive round? Where and how big are the gaps that you have to close to be able to match up with them? Which of your players would fit into this level of competition, and which wouldn’t be able to see the floor? It was a fascinating question. The playoffs, and Game 7s, are quantifiably more intense than regular season games. To believe that this doesn’t impact which players can succeed or fail when pressure and physicality and preparation is at its height is to believe that all players respond similarly to this different style of play. Which, I suppose, could be true — after all, they’ve all succeeded at a high enough level to be in the NBA in the first place, so the ones who didn’t respond well to pressure may have been weeded out earlier. But knowing what we know about human psychology, as well as accounts from players themselves, casts doubt on this line of thinking. 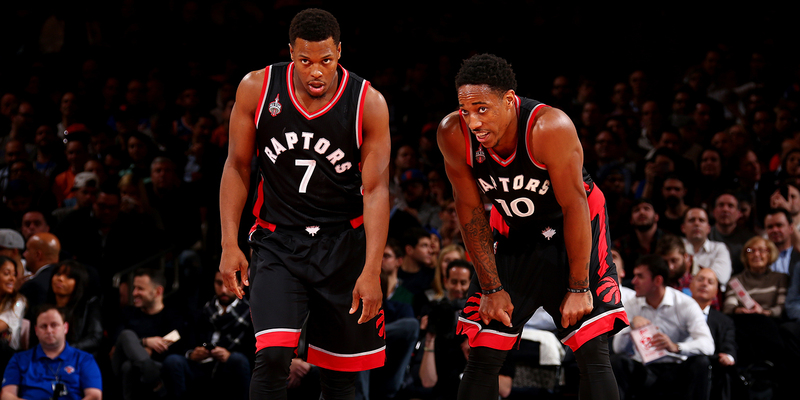 Maybe that’s what has been behind the well-documented playoff struggles of Kyle Lowry and DeMar DeRozan. It’s been multiple years now where both players have had worse playoff performances than expected. The simple conclusion is that they are just not “winners”, that they don’t have the mental make-up to elevate their games when it matters most — and, most importantly from a front office perspective, that it’s a mistake to tie yourself to players like this. But, just like personality and draft prospects, saying mental make-up matters is different from saying we can predict it. Players may struggle in the playoffs for any number of reasons. Maybe their poor play is due to a lack of psychological fortitude, or maybe it’s due to a lingering injury that isn’t made public. Perhaps they have easily scoutable weaknesses. Or possibly they’re facing the wrong opponent or simply having a few bad games. It’s incredibly difficult to distinguish amongst those, but you need to know what is causing the problem to know how likely it is to continue going forward. This problem is compounded by our love for spinning stories out of playoff letdowns. There’s nothing wrong with this from an entertainment perspective — you could argue sports are male soap operas — but if you’re in the business of making front office decisions, stories can often be deceiving. Take Dirk Nowitzki. An all-time great player, an MVP, but he was a choker who couldn’t win when the pressure was on. Until he carried his team to a championship when nobody expected it. This isn’t limited to the NBA. Peyton Manning always underachieved in the playoffs — and then won two Super Bowls. Andy Murray always melted down in the spotlight of Wimbledon — and then won it twice. Roy Williams’ teams couldn’t win the big one — and then won three championships. All of them couldn’t win when it mattered most — until they could. After Game 3 of the Toronto-Milwaukee series this year, it seemed that Lowry and DeRozan were once again proving their playoff shortcomings: Lowry was shooting 36%, DeRozan 34%, and the 3rd seeded Raptors had just gotten blown out by the 6th seeded Bucks. But then DeRozan went for an efficient 33 points in a close Game 4 and Lowry, playing through back trouble, scored 16 and dished out 10 assists in a pivotal Game 5 win. Did they suddenly discover how to be mentally tough? Or did they just take more time than expected to figure out an unconventional Milwaukee defense? Maybe Lowry and DeRozan will fall back into a funk, or maybe they’ve turned a corner and their playoff disappointments are behind them. Right now, at this moment, it’s incredibly difficult to tell either way.1 But once we find out what happens it will be easy to look back and write the story explaining it all — how Dirk grew from the 2007 Warriors upset, how they changed the rules for Peyton Manning, how Andy Murray found the right coach. Those stories might be true. Or it might just be that what looked like choking was bad luck or bad matchups. I wouldn’t argue with anyone claiming one side or the other. But I would say this: if these labels can change at a moment’s notice with no forewarning, if past performance is no guarantee of future results, then why do they help us? “How many of our players could play in this game?” It’s a great question, not just because it’s what so many front offices are asking themselves at this time of year, but because it’s a window into the complexity of player evaluation. For the teams on the outside looking in, these are the debates they’re having. Can these players win in the playoffs? Is this the piece that can take us over the top? Will we be regretting this signing next April? What really matters as we build our team? Because nobody wants to be watching at this time of year — they want to be playing.